The critical value of predators. Not so long ago there was some discussion about how important it was for the natural way of things to include predators. I mentioned how this had been the topic of a post published some time ago in this place. It was back in February, 2014 and I have republished it today. The critical value of predators in our wild lands. 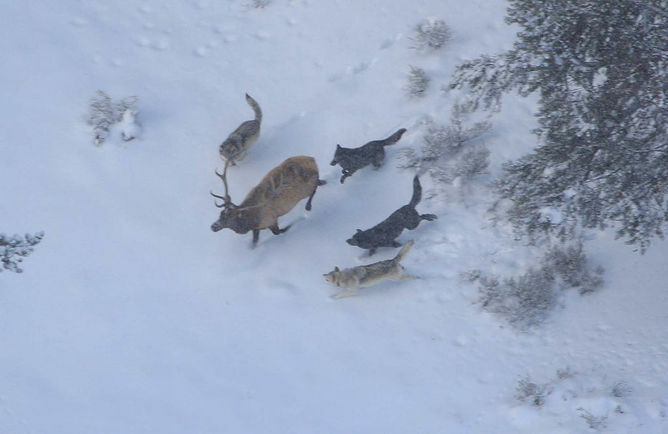 The consequences of the reintroduction of wolves to Yellowstone National Park. William Ripple does not work for, consult to, own shares in or receive funding from any company or organisation that would benefit from this article, and has no relevant affiliations. Man! We are a strange species at times! Interesting article, Paul. I think the natural order of nature should not be trifled with. Or rather we trifle with nature at our peril! You may be interested in a project started by George Monbiot and others to bring back Lynx, Wildcats, Wolves, Boar, Beavers, and other missing wildlife to Britain. It has been a slow but successful attempt to bring habitat back to balance and sustainability. That’s a great reminder for me. For I had been aware of Monbiot’s project a while ago then forgotten about it! Thanks for the link. We, humans, are predators. We are actually the top predators. We are greater predators than any predators, ever. Predation defines us. Predation, received and inflicted, makes us human. By destroying predators, we have been trying to dispose of the concept of predator, in a sort of final solution, hell-bent to destroy and devastate the concept of humanity. A final solution exterminating what we are. How can that be? Why to self-destroy? Because it profits the Elite, the Oligarchy, those among us who predate and think, and feel, accordingly. How is this at all possible? Human beings have been at the very top of the predation order, for millions of years. As early as Homo Habilis. That’s how humans survived in plains, steppe, desert and savannah, far from the trees. There was no refuge, except for the respect, not to say terror, that human beings inflicted upon other beasts. Masai children, ten year old, can walk among the ferocious beasts, because the ferocious beasts fear human beings. I experienced and practiced the same, a little bit, at the same age, in Africa. Seeing an enormous lion communicate respect, as one respects back, is awe inspiring. Then one knows intelligence rules, not just humans, but the beasts, the universe. No. Fanatical Pacifists have not understood the most important thing: they made themselves into ectoplasms lower than even sheep. Because indeed sheep themselves are not that pacific, they can be rather aggressive: horns and the like are not there by accident (I have had wild sheep, Ibex, pushing stones on me and others, from up high, deliberately, many times; But for a helmet, once, my spouse would have been killed, by an Ibex sent stone; also once a gigantic sheep, approaching me with a stupid, benign, absent-minded look on its face, then proceeded to push the unsuspecting me off the mountain with its sheer mass…Ever since I have known sheep can be Machiavellian). Large predators should be reintroduced everywhere outside of cities, and a few parks. Even in Europe. Large predators, by the way, are not the potentially most lethal: elephants are the most dangerous beasts in Africa, followed by buffaloes (I was charged once by a cow). The key with elephants is to go up wind, and stay as far away as possible from the irascible, vengeful pachyderms with their enormously resentful large brains. Let’s reintroduce the entire megafauna, de-extincting species as needed. Yes, it will be frightening. Yes, it will mean we have to learn to instill respect, and show, ourselves, respect for the laws of nature, and the laws of the jungle. Having leaders with their fingers on thermonuclear fire, fed and promoted by bankers, is not natural. We have organized an unnatural order of things, and conditioned ourselves to expect, and respect it. Thus the biosphere is going down the drain. Unimaginable wars are getting prepared. Time to rebel. Time to recover an environment which gives us sense, far from Absurdism. We are made to experience the megafauna, to be ourselves, in full. How can we fix the world, the world we are destroying, if we are not fully ourselves? Let’s reintroduce an environment which inspires us and teaches us respects for the laws of nature. Megafauna is central to that. Patrice, I hardly know how to respond to your interpretation of where humanity finds itself today. Not because I disagree with your analysis, far from it! It’s more because I sense the arrival of something beyond the realm of what we, humanity, understand. In no way did it lessen my feelings of uncertainty. Down even to being uncertain of what to say here! Paul: Thanks for admitting to uncertainty. Our powers have never been so great, thus, so is our uncertainty. It’s healthy to admit it! As I told Colettebytes, it took me a very long time to get where I am now. Assuming the supremacy of Nature is most humbling, yet most instructive. It took me a long time to get there! A wonderful post Paul and I have to agree with Patrice, for saying it is about mutual respect and learning to adapt with one another as Nature intended..
“By reintroducing megafauna, we will not just recover ecological balance for the planet, but mental balance, for ourselves. We humans have meddled in nature and we have upset the natural balance.. We take species also away from their own natural habitats and place them where they shouldn’t naturally be.. Then we cry out when the balance is upset and other species then suffer as a consequence..
We have only to look at the crayfish in our waters in England.. The American Mink in the UK .. The rabbits in Australia .. not to mention the various insects now being brought across the Harlequin Ladybird, which is wiping our our own Ladybirds.. The lists goes on and on.. The ravages of the insect world in the USA are beyond alarming. I lived for decades next to a forest which saw thousands of Monarch butterflies visiting every year. Now we are lucky if we see ONE, in an entire year: thanks nicotinoid insecticides for this. No wonder US life expectancy is going down! Well Nature has managed quite well so far Paul.. And will no doubt sort us humans out at some future point on the horizon.. So, while I try to be mindful of our environment.. Recycle, care for nature and mother earth and try to be kind to my fellow human beings.. There is not much else to do.. So I am learning to enjoy more now moments, the past is gone and I can not undo.. and tomorrow is never going to arrive.. So. LOL 🙂 We do our best, in our now moments and if we understand the only person we can change is ourselves.. And the more of us who see this and try to do so, to live in harmony and peace with each other.. Then we are indeed helping change the world.. One thoughts, One deed, One Action at a time..
🙂 It is a sad fact.. That Mankind never seems to learn from his mistakes.. or else why would we keep repeating them?? And I would love it for wolves to be roaming free.. And have watched some wonderful documentaries on how they are being introduced in certain area’s again.. It is only the Fear mankind has built up within him that sees these wonderful animals as dangerous to him..
And my read is superbly matched by another wonderful reply from you, Sue! You express the fundamentals of who we are so perfectly! An excellent post showing evidence for rewilding and preserving large carnivores throughout our planet. Please use your voice to let our governments know that you support protections for wolves in North America.